Kilmeena ran out easy winners in what proved to be a fairly tame contest. We went into this game expecting a tough encounter from the men from North Mayo, but the expected battle never materialised. Kilmeena 3 - 12 Ardnaree 0 - 1. Playing with the strong breeze at their backs Ardnaree were determined to try and make a game of the second half. In the first ten minutes they rattled off three points. However, yet another pulsating move from defence saw Johnny mcGlynn on the final pass to deliver the ball to the net with all the composure of a player of more advanced years. Seanie Ryder and Aaron Mcginley followed up with fine scores from distance, only for Ardnaree to get some compensation with a goal to the roof of the net. 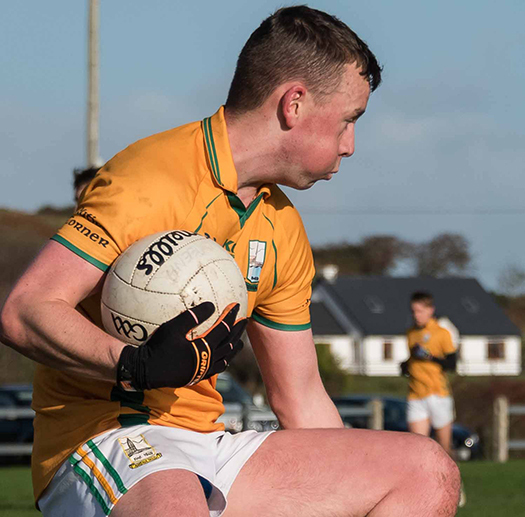 Entering the final quarter Kilmeena once again took the game to their opponents and after Keith Joyce swapped points with another Ardnaree score, Joey smyth combined well with McGlynn to fist the ball to the net. Ardnaree came back with another two points but the game ended with a final flurry of Kilmeena points from Ryan Mcgonagle, Niall feehan, McGlynn and Seanie Ryder. This was an excellent victory with some fine play from the Kilmeena lads. The quality of passing and handling was excellent and when not in possession the work rate and tackling was of the highest order. In games like this it is very hard to single out individual displays but, Stephen Staunton, Keith Joyce, Niall Feehan and Sean Ryder were the pick of so many outstanding displays. Andrew Grealis in goal was excellent in his kickouts with Paul Moran coming off the bench to put in a good second half shift. 0 - 1, Ryan McGonagle 0 - 1, Niall Feehan 0 - 1. Kilmeena travelled to this opening fixture more in hope than expectation against a fancied Ballintubber outfit, and minus a number of senior players who were ruled out through injury and holidays. However, what unfolded was a display of sheer bloody mindedness that belied the youth and inexperience of the 15 players who togged out on the day. Despite being four points down at the short whistle, the boys knew that this game was there for the taking and on the restart set about dismantling Ballintubbers confidence. A steady start saw another McGlynn free cancelled out by a Ballintubber point, and then the fun and games began. Johnny McGlynn slotted over a fine composed score followed very quickly by a Niall Feehan point, and then a minute later in a move which carved opened up the home defence Ryan McGonagle slotted to the net, and this was quickly followed by an outrageous free from distance from Chris Heanue. In the space of five minutes, Kilmeena had gone from four points down to two points up. 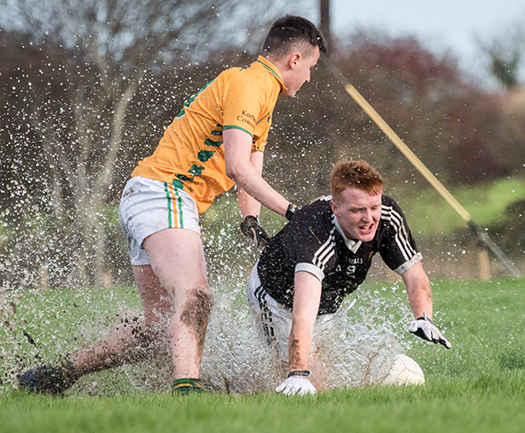 There followed a period of Ballintubber pressure where Andrew Grealis in goals pulled off two outstanding saves, and then defying all the odds Kilmeena swept upfield and after excellent work from Keith Joyce, Alex O'Riain found the bottom corner. With ten minutes left, it was now very much a case of the walking wounded having to soldier on in a tough uncompromising battle, and battle on they did. Going into the last five minutes, Ballintubber reduced the margin to three. They were now driving on looking for the equalising goal, but the best they could muster was a point from a placed ball. There was more left in this battling Kilmeena team, and they built again from the back for Bailey Nevin to point from distance at the final whistle. This was one of those games that goes down as a great one to win, and a bad one to lose. The sheer will to win was evident in a team that had no respect for the reputation of their opponents, and in their leaders they had individuals who were determined to ensure there was only one outcome to the game.